Len Anderson got his start in baseball coaching as an assistant to Lee Dobyns and John Gleeson at Flowing Wells High School from 1972-83. In 1983, the Caballeros won the state championship. He was a Big League All-Star Assistant under Gleeson from 1979-81 during which the team won state and district championships twice and captured the Western Regional title in 1979, finishing seventh in the World Series. Anderson became a Big League All-Star coach in 1982 and in his second year his club won the state, district, and Western Region championships, finishing third in the World Series. Anderson became head baseball coach at Flowing Wells High School (1984-89), winning two league titles. Anderson moved on to Pima Community College as associate head coach for nine years, during which the Aztecs won two regional titles and were Junior College World Series runners-up in 1992. 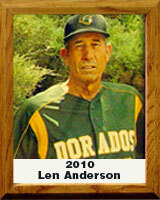 Anderson retired from coaching in 1999 to watch son Dennis begin his professional baseball career. He returned to coaching in 2005 as head baseball coach at Canyon Del Oro High School. The Dorados won league titles in 2005, 2007, 2008 and 2009, reaching the state semifinals in 2007 and winning the state title in 2009. Anderson has won numerous Coach-of-the-Year honors and eight of his pitchers from Pima Community College were drafted into pro ball, with two making it to the major leagues. He was a science teacher for 32 years and was deeply involved with the Career Ladder Program allowing him to mentor many teachers as their instructional coordinator.